Ethel is the most gentle and relaxed cat in the world. She was given to my son as a Christmas present in 1993. She was a tiny kitten and, when he moved out of town about a year later, he left her with my husband and I. I used to do that to my parents too. She is Jasper’s mother and he was in her second litter. I hauled her off to the spay/ neuter clinic after that last litter and I think she has led a much nicer life not to be reproducing every year. Besides, I was starting to fear that I couldn’t give all the kittens away after Jasper was left over. Food and vet bills, Frontline, feline leukemia tests are all beyond my budget. I can’t afford my own health care. Ethel is the best hunter in the world. I think cats like to hunt as recreation….it is who they are. She mostly brings up mice and moles and leaves them on my doorstep as presents. In the spring she gets to the baby birds in their nests. A bell does not stop her from raiding a nest. I try to keep her in all spring, but it is hard. My Dad, an avid conservationist, hated cats because the feral cats in our neighborhood made a healthy diet of birds. He would anguish over each feathery kill he would find in his woods. He was a botanist so he knew how important the birds were to the plant kingdom when it comes to broadcasting seeds. 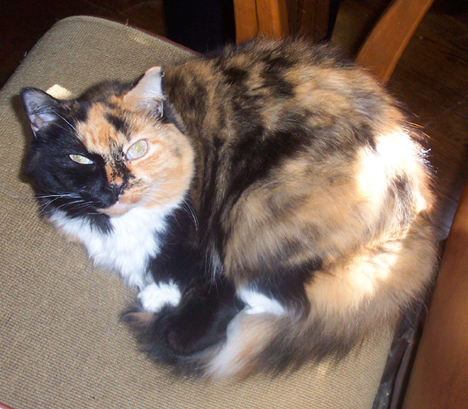 When I became an adult, however, my husband gave me a little calico kitten who I named Maggie, of course. After that, I have never been without a cat in the house…….. even though it just kills me to see them destroy a nest of baby mockingbirds. ~ by Sandra Lynn Gray on September 13, 2007. What a pretty cat! This linked to my journal as a “possibly related post” when I posted a very old picture of a cat named Ethel my father’s family had back in the 40s. Ethel is a great name for a cat. Thank you ednamillion. I tried to go to your blog site but couldn’t figure out how to get there. I couldn’t just click the mouse and land on it. I am still learning the new WordPress format. It is interesting that they give you linked to similar posts. I will have to try them more often.